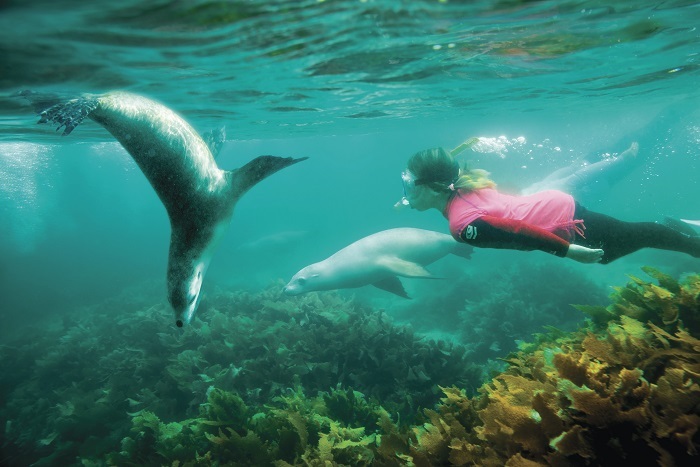 Explore the stunning natural scenery of Australia as we take you on the 10 Day Adelaide to Perth Tour, passing through wild landscapes, ancient forests, and rich indigenous cultures. At night, you’ll camp beneath the stars, soaking up the mesmerising southern skies in true bushman style. Our 10 Day Adelaide to Perth Tour will take you on a journey through some of Australia’s vast and constantly-changing landscapes, giving you the opportunity to see the Australian outback and the abundance of wildlife along the way! As you take in the stunning sceneries of the national parks, you will get to learn about the history of the indigenous culture of this region. You’ll be sure to leave the tour with memorable memories to last a life time! We commence our 10 Day Adelaide to Perth Tour, nice and early on day one as we head out from the City of Churches. We journey north to the town of Clare for morning tea before gradually making our way to the rock gorges and Red Gums of the Flinders Ranges. Here you’ll get the opportunity to stretch your legs with a walk-through the Alligator Gorge (not to worry though, there are no crocs here!) After lunch, we’ll continue our exploration and wander off the beaten track of at the beautiful Warren Gorge in the Flinders Ranges. You might even get lucky and spot the threatened species, the Tallow-footed Rock Wallaby. We’ll settle down to camp in Warren Gorge and spend the night sleeping under the stars of the Southern Cross. We begin our morning early on day two and get ready to hike the prominent landmark bluff known as the Dutchman’s Stern. The rugged surrounding landscape is home to a host of plants and animals. Our journey continues to the Eyre Peninsular, known for being one of those places where people get blown away by its astonishing seafood frontier! Grab a kooky photo with the eight-meter- fibreglass structure of the Big Galah and immerse yourself in the beautiful scenery overlooking the tiny town of Kimba. 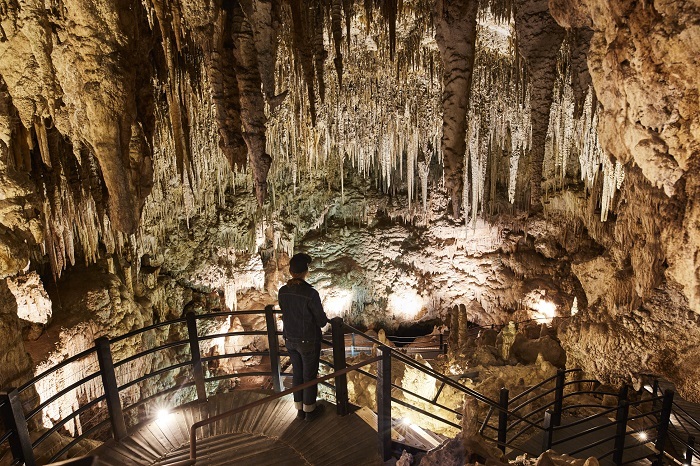 Followed by lunch, we venture to our next destinations at Venus Bay and Talia Caves. For an unforgettable adventure for our thrill seekers, you can test out your sandboarding skills at the Lake Newland sand dunes. During the afternoon, we head into Coodlie Park to enjoy a delicious BBQ feast before settling in for our night’s stay, in a swag hut. The following morning, marvel at the beauty of Baird Bay, a spectacular and peaceful place full of aquatic wildlife. In the morning, you’ll have the option for a swim or snorkel off the beach or take the opportunity to swim with sea-lions and dolphins on a 3-hour cruise (at own expense of $180). It’s an unforgettable experience you’ll always treasure! Following a picnic lunch on the beach, we venture towards Sceale Bay, known for its many splendid bays and pristine beaches! Here you’ll get the chance to test out your surf skill in the clean waves. For those not wanting to surf, enjoy a nice relaxing stroll on the white sandy beaches or simply just explore the picturesque Sceale Bay. Followed by dinner, we’ll get the opportunity to visit Penong Pub, a perfect chance to get to know the locals and experience some of the country hospitality! In the evening, we’ll settle down to camp for the night at the little township of Penong. To start the day, we venture out to cross the 5,320-kilometre-long dingo fence, as we see the famous wombat, emu, camel road sign on the Nullarbor. We stop off at the impressive Bunda Cliffs to see where the Southern Ocean crashes up against the cliffs of the Great Australian Bight! Here you’ll marvel at the endless cliffs towering over the vast unspoiled ocean full of wonderful marine life. As our adventure continues, we settle to our bush camp under the Southern skies on the Nullarbor, where our entertainment tonight is provided courtesy of the celestial sphere. Our day starts early on day five as we travel across the last part of the Nullarbor and onto one of Nullarbor’s hidden gifts, the Caiguna Blowhole to experience the free air conditioning from the ocean! After lunch, we’ll continue our adventure to the stunning seaside of Esperance, which may feel like a busy city compared to the outback experience. To conclude our day, we set up camp in the marvellous Cape Le Grand National Park. Today, you’ll get a free morning here to spend however you like! Whether it’d be setting out for a coast bushwalk, splashing about in the sea, taking some unforgettable photos or simply relaxing with your new friends along the magnificent beach of this national park. 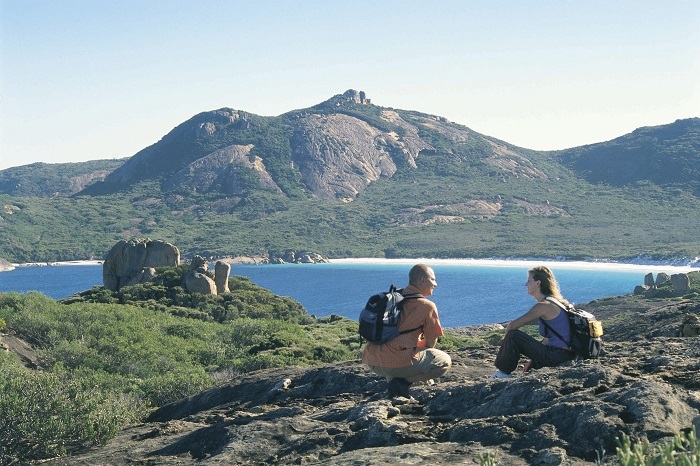 Following this, we hike up to Frenchman’s Peak, where you’ll enjoy spectacular views of the of the Esperance region, in particular the astonishing beauty of Cape Le Grand and the Recherche Archipelago. We start the day with a morning stroll along the beach to look out for local kangaroos, before venturing towards Frenchman’s Peak. Climb to the top of this rocky peak to be rewarded with breathtaking views of Cape Le Grand National Park and surrounding regions. We’ll stop over at one of the pristine beaches along Esperance’s Great Ocean Drive for lunch before we make our last stop to our campsite in Stirling Ranges at Mount Trio. 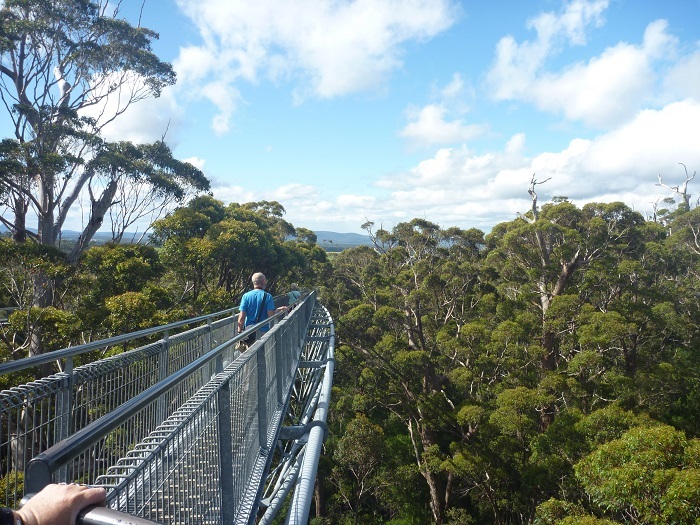 On day eight, we journey towards the ancient granite domes of the Porongurups, rising from the landscape like an island surrounded by the lush forest of Karri Trees. We’ll continue our journey with a two-hour hike through the lush temperate forest to Castle Rock, where you’ll be rewarded with picturesque scenery – be sure to get your camera ready for some awesome Instagram worthy photos! In the afternoon, we’ll travel along Western Australia’s Great Ocean Road. Here you’ll see spectacular coastal views, turquoise seas and remarkable rock cliffs shaped by eons of crashing waves and rolling tides. As we continue our journey, we veer off to the Natural Bridge, Elephant Rocks and Green Pools for a quick relaxing dip a before our last stop to the largest Tingle Tree in Western Australia. To conclude our adventure for the day, we settle into our swag camp at a caravan park. 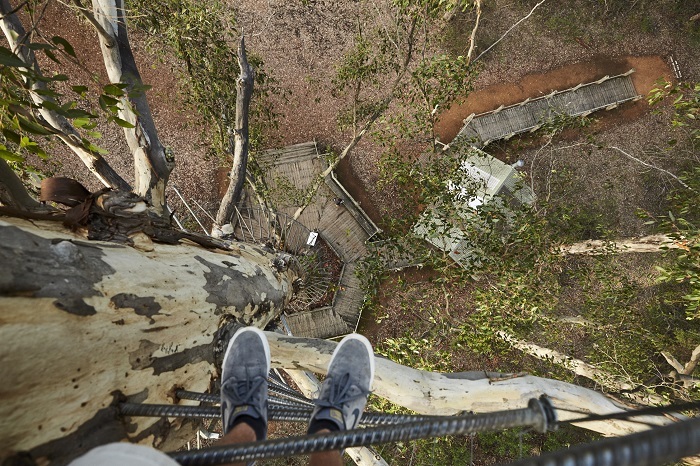 As we are near the end of our adventure, we’ll discover the pristine wilderness region of Walpole – for our thrill seekers, if you are feeling brave you can climb the 50 metre Diamond Tree and enjoy the views from 75 meters about the ground! Next, we feast on the delicious local fare of the Margaret River. Here you’ll get a little taste of their boutique breweries, chocolate, cheese and even a fudge factory along the way! On the last day of our adventure, you’ll wake to the familiar warble of kookaburras and cockatoos before we continue our adventure along the coast to Perth. We then head to Ngiligi Caves, to wander through the ancient wonders of its limestone’s ridges of Ngiligi Caves and its aboriginal history. 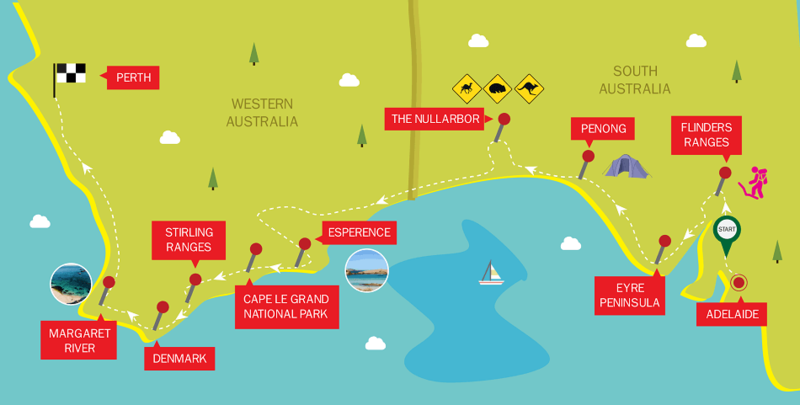 After lunch, you’ll get the chance to explore the popular tourist town of Busselton! 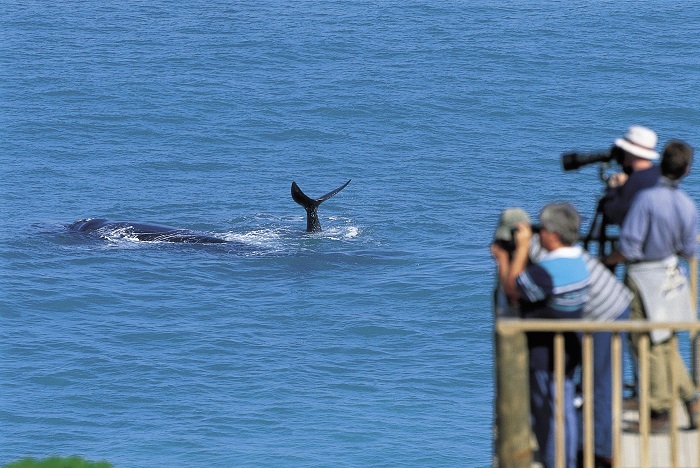 The quaint seaside town is known for its pristine beaches and popular area of the seasonal humpback whales. We’ll keep heading north towards our final destination, Perth, in the early evening. We say goodbye to our new friends and reflect on the amazing adventure we had on the 10 Day Perth to Adelaide Tour. Please note: as sleeping bags are not offered for hire on this tour, please ensure to bring your own.